UVKSetup.exe -Silent -Auto -NoRP -NoDShct -NoCMenu -NoAU -NoRun -Installdir "Install path"
UVKSetup.exe -Silent -Auto -NoRP -NoDShct -NoCMenu -NoAU -NoRun -CustomDir "Install path"
-Silent : Switch used by the auto update feature. No UI is shown, no restore point is created, UVK is executed after install. -Auto : Unattended mode, No UI is shown. UVK is executed after install, unless you specify -NoRun. -NoRP : Not to create a system restore point before installing (not recommended). -NoDShct : Not to create a desktop shortcut. -NoCMenu : Not to create the "Force delete" and "File information" context menu items. -NoAU : Disable Auto Update. -NoRun : Not to run the main application after installing. By default the main application is executed. -Installdir "Install path" : This switch pair specifies the directory where UVK should be installed. 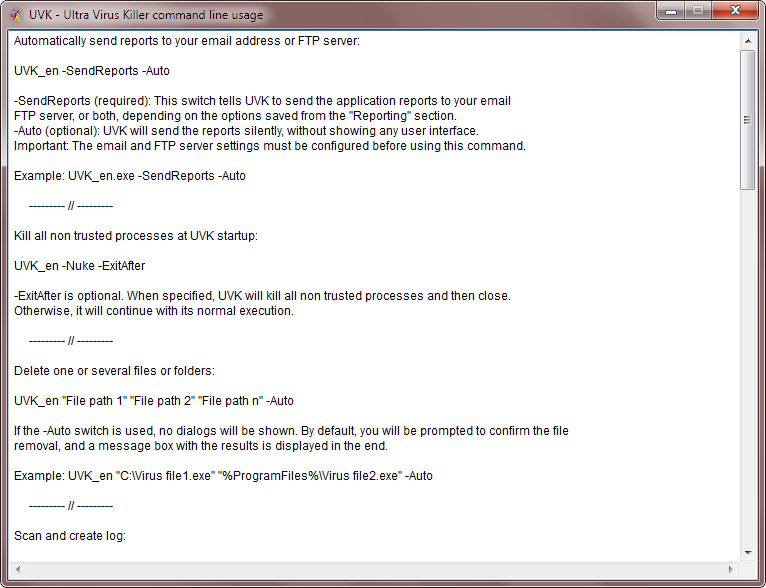 UVKSetup will add a subfolder named UVK - Ultra virus killer, unless the path you specify already has that name. UVKSetup.exe -Auto NoDShct -NoCMenu -NoAU -NoRun -Customdir "%SystemDrive%\TOOLS\UVK"
-SendReports (required): This switch tells UVK to send the application reports to your email address, FTP server, or both, depending on the options previously saved from the Reporting section. -Auto or -Passsive specify the UI mode: No UI or progress only, respectively. Do not use both. Important: The email and FTP server settings must be previously configured before using this command. -Nuke (required): This switch specifies that UVK will automatically kill all non trusted processes at lauch time. -ExitAfter is optional. When specified, UVK will kill all non trusted processes and then close. Otherwise, it will continue with its normal execution. -CreateLog "Log Path" : These two switches must be used together. "Log Path" specifies the full path of the text file to write the information to. All Windows environment variables are supported. We recommend that you enclose this swicth in double quotes, in case it contains white space characters. -ShowMsFiles : Show Microsoft signed files in the log. By default, these files aren't shown. -ExitAfter : Close UVK after the log is created. If -Auto or -Passive is used, this option is automatically enabled. -ReadFile "Script Path" : These two switches must be used together. "Script Path" specifies the full path of the script file. All Windows environment variables are supported. We recommend that you enclose the "Script Path" swicth in double quotes, in case it contains white space characters. -EmptyBin : Empty the recycle bin before running the script. By default, it will NOT be emptied. -EmptyTemp : Empty the temporary folders before running the script. By default, they will NOT be emptied. -RPoint : Create a system restore point before running the script. By default, it will NOT be created. -ExitAfter : Close UVK after running the script. With the -Auto switch, this option is automatically enabled. "uvksrfile": This switche specifies the full path of the uvksr file to load. We recommend that you enclose this swicth in double quotes, in case it contains white space characters. -WriteSysInfo: Tells UVK to gather all system information shown in the System Info section and save it to an html file which path can be specified in the parameter "Log path". "Log path" : Specifies the path of the html log. If this parameter is not specified, then the log will be created in the current user's desktop and will be named System Info.htm. We recommend that you enclose this swicth in double quotes, in case it contains white space characters. -Open : Defines whether to open the system info log with the default browser after its creation. If this parameter is not specified, the log will not be opened. Empty all users temporary folders and the recycle bin. No user interaction will be needed. Uninstall UVK in normal or silent mode. -Auto or -Passive specify the UI mode: No UI or progress only, respectively. Do not use both. Update UVK in automated silent mode. This switch must be used alone. No gui is shown. UVK will search for a new version on the background, and if it finds it, downloads and installs it silently. This command creates an SFX package as you previously set in Options > Utilities > Create SFX package. Please see the corresponding help page for more information. -Customdir "Install path" : Specify the custom installation directory. The application will be installed in the directory you specify in "Install path". We recommend that you enclose this swicth in double quotes, in case it contains white space characters. -NoRun : This switch tells the package that the main application should not be executed after extraction. With this command, UVKPortable will extract UVK and create a log on the system drive's root. UVK Portable also has some special features. It supports drag & drop of uvksr files and UVK scripts to automatically load them. So, if you want to launch UVK through UVK Portable and load a script simmultaneously, drag and drop the script file over UVKPortable's icon. Because the SFX packages created by the SFX creator are based on UVKPortable, all of the above applies to them too. You don't need to specify the full path to UVK_en.exe. Just using the executable file name should be enough. All command line switches are case insensitive. You can use both - or / characters. e.g. -ReadFile or /ReadFile will both work. Parameters and paths with spaces must be enclosed with double quotes. Some of these command line switches are only supported in the version 4.1 or higher.